ABC News had an exclusive interview with Willa Junior, also known as the guy who got trapped in the cargo hold of an Alaska Airlines plane, on Thursday. Junior was taking a nap when some luggage fell on his head. He tried to call 911, but the connection was bad. He then began to bang on the ceiling very loudly. 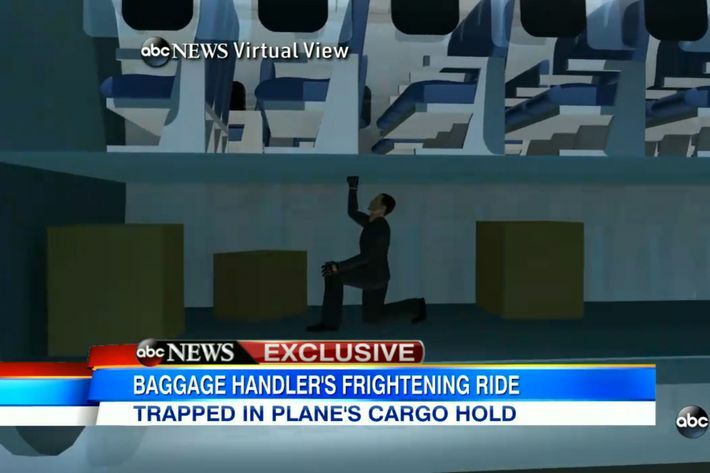 ABC News, a leading purveyor of animated airplane reenactments, re-created the moment for its viewers. Junior still works for the aviation contractor that employed him, but Alaska Airlines banned him from working its flights.